Join the Geesta Iced Coffee Revolution and brew delicious, fresh cold brew coffee at home. The iced coffee maker system combines two simple materials that you can set up in seconds to brew coffee overnight in the refrigerator. Through the slow steeping process, cold brew coffee is nearly acid-free and without a paper filter to absorb vital aromatic oils, you'll be able to taste the bold chocolate, floral, and fruity flavor notes of your favorite coffee beans. Set the stainless steel coffee infuser into the 2-quart wide-mouth glass mason jar and pour your coarsely ground coffee beans inside. The coffee filter has an innovative half-cone design for optimal permeability and potent steeping. Plus, the polished metal is precision-made with a 600-grade mesh that is so fine, it guarantees brewed coffee that is almost entirely sediment free. For best results, slowly pour in room temperature water while you stir to wet all of the coffee grounds. Thanks to the molded markings on the side of the heavy-duty glass mason jar, you can easily measure and brew one or two quarts of cold brew coffee at a time. After 12-24 hours, easily pull out the infuser with the built-in handle and wash the Geesta infuser and jar by hand or put them in the dishwasher. You're going to love making all of your favorite iced coffee treats and steeped teas at home - the possibilities are endless! EASY TO USE: Brew delicious, flavorful cold brew coffee at home overnight simply by pouring course grounds into the coffee infuser and stirring in room temperature water! ENDLESS USES: In addition to cold brew coffee, you can also use the coffee filter to brew tea or infuse water with fruit or oils and add another mason jar for a rotating system. BEST MATERIALS: Brew coffee through the premium stainless steel coffee infuser and store brewed batches in a chemical-free glass 2-quart wide-mouth mason jar. 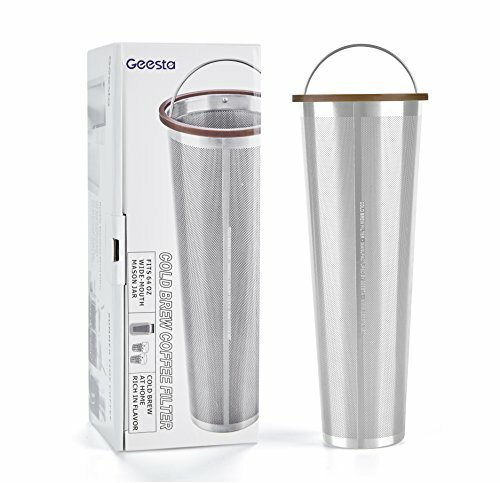 ULTRA-FINE: The stainless steel infuser is rated with 600 mesh to achieve sediment-free coffee without losing aromatic, flavorful coffee oils to an absorbent paper filter. BUILT TO LAST: Every detail is perfectly crafted for you with ultra-durable, premium materials that are built to last and easy to use.